There’s something compelling and fey when outdoor creatures come inside. Sandra Maresca’s narrative animal paintings move the animals into our intimate, domestic consciousness in a delightful way. Bright colors and primary forms lend a graphic, deceptively childlike look to the paintings, with echoes of folk motifs and domestic ornament. Sandra references the flattened, decorative “Les Nabis” style: iconic forms , local color, and applied arts designed for everyday enjoyment. The paintings tell stories on many levels. Lambs on a bed make us think of the wool used in blankets as well as “counting sheep.” They also have a feeling of the “see no evil” monkeys, with secrets under the fleece. After all, they are sitting on that most intimate of worlds, the bed. When the wilderness is moved inside, on to a bed or chair, invading the private world represented by our houses, the animals begin to speak their own language of inhabitation. Here the human is on the outside, looking into a wallpapered world occupied by the animals. The forest wildflowers now blossom on walls, while the trees have become furnishings. 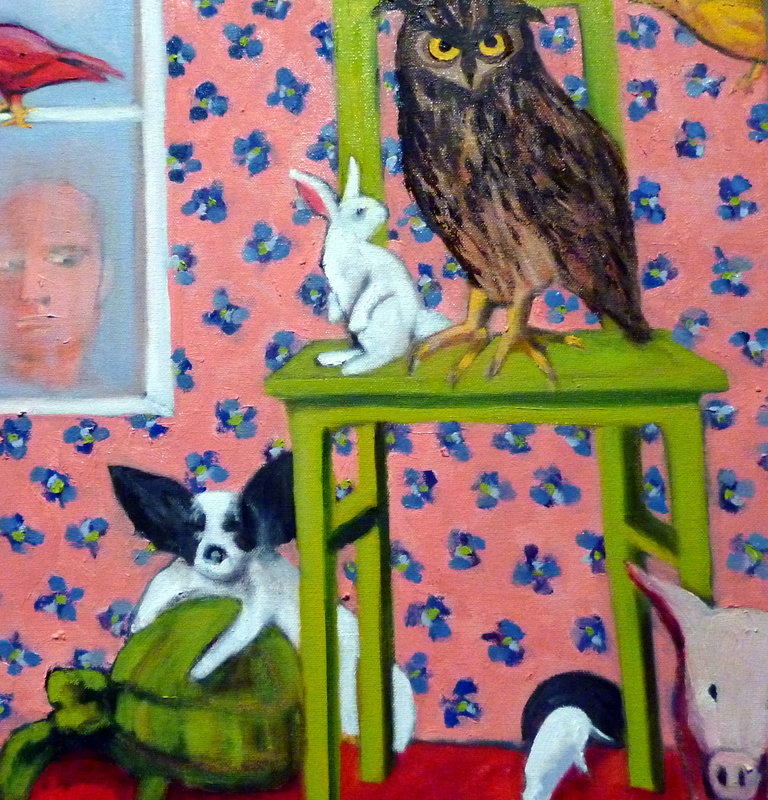 The green chair is like a forest floor, with owl and rabbit. Our houses used to be homes to domestic animals. When Scott and I visited Matera, in South Italy, where families lived in limestone cave warrens, the donkeys lived in the back of the cave, behind the matrimonial bed, while the chickens lived under it. I see our modern loss of connection to the animal world in a daily sense of farm, wilderness, home, and food as a wound; our longing erupts in overbred “purse dogs” and animals treated as human children. 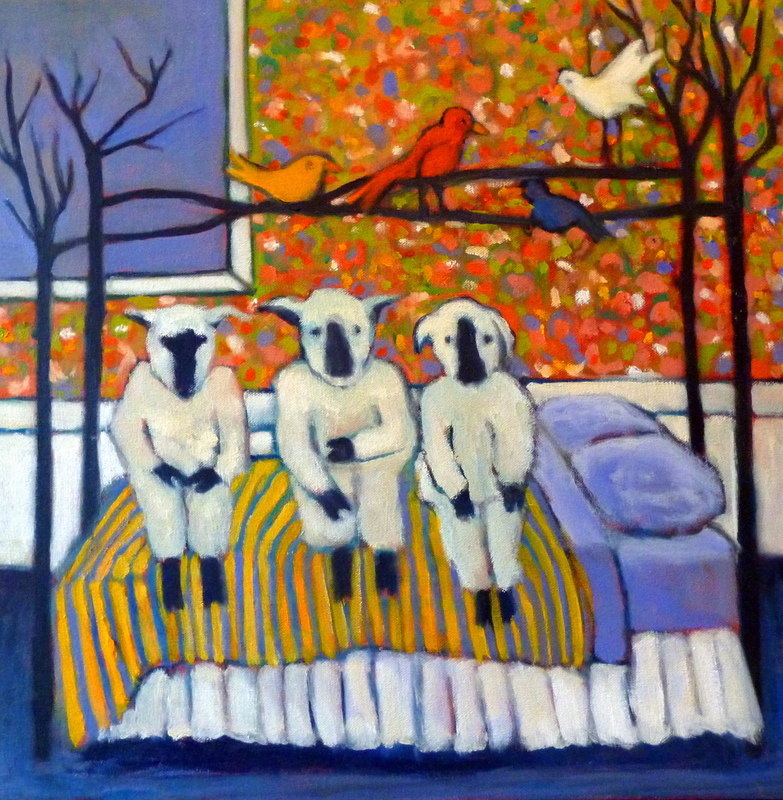 Sandra’s paintings have some echoes of Bonnard in her use of animals in patterned domestic spaces to define intricate worlds. Her animals instruct as well as entertain. I saw Sandra’s show on the First Friday Art Walk in Guerneville in March. 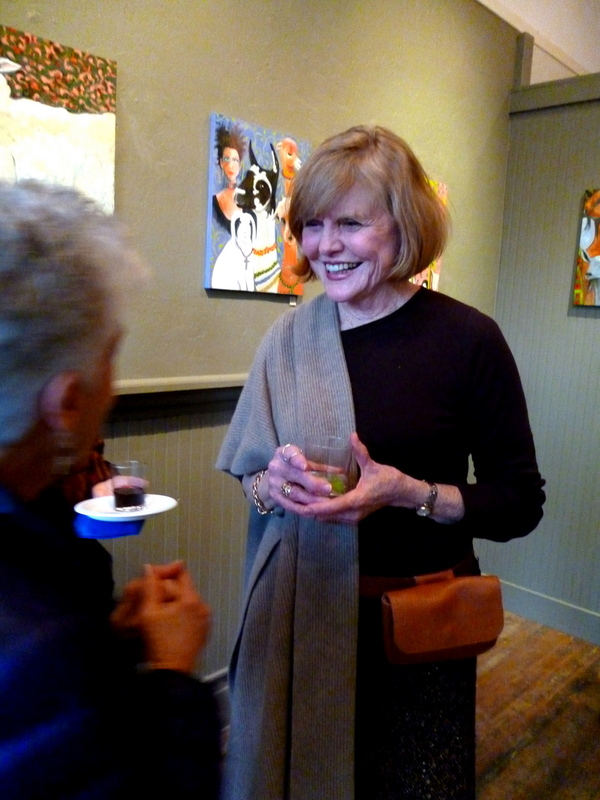 I was impressed by the fine gallery space that The Blue Door Gallery provided. Johanna Ottenweller, mosaic artist, has done a wonderful job of creating a Craftsman-style environment that displays art with simplicity and elegance. For more of Sandra Maresca’s paintings, visit her website or drop by the Blue Door Gallery (see details below). Sandra’s studio will be open during the Art at the Source open studio tours the first two weekends of June. Don’t miss her handmade fur and wool animal sculptures: adorable, totemic, and often beautifully disturbing, like something from the ancient days. I own one.